Most liquid sweeteners are slightly more nutritious and have more interesting flavors than white sugar, though substituting them for granular sugar usually requires modifying recipes a little. Honey contains beneficial antioxidants, but amounts vary by type (buckwheat honey tends to be the best in terms of antioxidant power). Many people believe that honey has medicinal properties and use it in home remedies for cold symptoms such as sore throats. When substituting this more environmentally friendly and less processed option for sugar, use approximately 1/2 to 3/4 cup of honey per cup of sugar and reduce liquid in the recipe by around 1/8 to 1/4 cup. Reducing the oven temperature by approximately about 25°F and baking a bit longer is also recommended. Derived from the sap of maple trees, this syrup contains beneficial nutrients such as manganese and zinc (choose the darker Grade B for a more nutritious option and stronger maple flavor). Maple syrup adds wonderful flavor to pies, muffins, and other sweet quick breads. When baking with maple syrup, use 1/2 to 3/4 of a cup of syrup for each cup of sugar you replace and reduce the liquid in the recipe by 2 to 3 tablespoons. Rising ability may be affected, so adding a small amount of extra baking soda is recommended (various sources suggest anywhere from 1/4 to 1 full teaspoon of baking soda per cup of maple syrup – experiment with your recipes to see which amount works best). Many sources also recommend reducing salt by the same amount as the added baking soda. Molasses, which is particularly nice in ginger cookies and brown breads, contains beneficial nutrients such as iron and calcium. 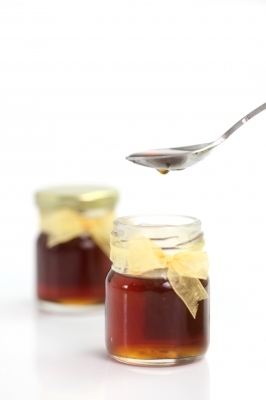 When replacing white sugar with molasses, use 1 1/3 cups of sweet (not blackstrap) molasses for each cup of sugar and reduce the overall liquid in the recipe by 2-6 tablespoons per cup replaced (you may need to experiment, because ideal liquid reduction will vary from one recipe to the next). Lower the oven temperature by 25°F and add a 1/2 teaspoon of baking soda per cup of molasses, reducing salt in the recipe by an amount equal to the baking soda added. Notes: experts typically recommend replacing no more than half of the sugar with molasses in most recipes; if you need to replace molasses with sugar rather than the other way around, use 3/4 cup brown sugar per cup of molasses and add 1 teaspoon cream of tartar. Agave is derived from the plant used to make tequila. This sweetener is similar to honey, though not quite as viscous. There is debate regarding whether or not it’s healthier than sugar, but it’s relatively low on the glycemic index. Agave is more calorific than sugar and very sweet, so it cannot be substituted 1 for 1 in recipes. If you want to use agave nectar, substitute 2/3 to 3/4 cup of agave nectar for each cup of sugar and reduce the overall liquid in the recipe by 1/8 to 1/4 cup per cup of sugar as well. You’ll also need to reduce the oven temperature by about 25°F and possibly increase the baking time by a few minutes. This rich, malty syrup contains more protein and complex carbohydrates than sugar, though it’s not as sweet. Replace 1 cup of sugar with 1+1/3 cups barley malt syrup and reduce other liquid in the recipe by approximately one-fourth. Baked goods may not rise as well when using barley malt syrup, but adding 1/4 teaspoon of baking soda per cup of syrup will aid the leavening process (reduce salt by 1/4 teaspoon for each 1/4 teaspoon of baking soda added). This rice-derived sweetener is higher in complex carbohydrates and not as sweet as sugar, but it’s actually higher in calories and can make baked goods too crisp, so it’s not usually the best option for baking, though it can be nice in muffins and energy bars. When substituting for sugar, use 1+1/4 cups of rice syrup per 1 cup sugar, reduce liquid in the recipe by 2 tablespoons for each cup of sugar replaced, and reduce the oven temperature by 25°F to avoid over-crisping. As with barley malt syrup, baked goods may not rise as well when using brown rice syrup, but adding 1/4 teaspoon of baking soda per cup of syrup can aid the leavening process (reduce salt by 1/4 teaspoon per 1/4 teaspoon of baking soda added). This sugar substitute can be useful when making homemade candy. Replace 1 cup of sugar with 3/4 cup corn syrup, reduce other liquid in the recipe by 2 tablespoons, and reduce the oven temperature by 25°F. For more on sweeteners, see the main Sweeteners page. For more baking substitution options, see the main Cooking and Baking Ingredient Substitutions page.